You're receiving this newsletter because you are a recent customer or have signed up on our website. Not interested anymore? Unsubscribe Having trouble viewing this email? View it in your browser. Our engineers work tirelessly with the goal of creating the most eye-catching, exhilarating and safe vehicles on the road. And now, we want to celebrate them for something truly special. a Top Safety Pick Plus. 1 (Models equipped with available Smart City Brake Support and Adaptive Front-lighting System). Looking for a better deal on our already low priced used cars? Search our Pre-Owned inventory on Auto trader for select vehicles with a $200 off coupon. CLICK HERE to find Special Savings on select vehicles. You must present coupon to receive discount, coupon cannot be combined with any other discounts or negotiated price see dealer for details. For the month of August and September 2017, present this email with your purchase of a vehicle from Crippen and receive $100 discount on our Paint and Fabric Protection. Be sure to ask our Business department at the dealership about the benefits of having your vehicles interior and exterior protected from paint fading and unexpected interior spills. When you think about what attracts most customers to vehicles a very common response is the "appearance." So why not protect what drew you to the vehicle in the first place further? Our paint and fabric coat is a silicon/oil based treatment that is performed on the interior and exterior of your vehicle. The exterior is treated with the oil based portion which acts as a "locking" mechanism on the showroom shine of the vehicle and keeps such items as acid rain, bird droppings, and tree sap from seeping in and causing decay on the paint. The interior is treated with the silicon based chemical which acts as an oil based (ex: soda, coffee, etc..) stain deterrent on the carpets and seats. A one-time coat on a new vehicle is good for 5 years and a one-time coat on a pre-owned vehicle is good for 3 years. Full Factory Multi-Point Vehicle Inspection with every service! Click Here to schedule Mazda service. Click Here to schedule Volvo service. Keep in mind that the Body Shop at Crippen is ready to repair any damage that may have happened this summer. Stop in for a free written estimate for repairs. We are happy to co-ordinate the repairs with your insurance company if needed. company can suggest a body shop but it is your right to choose your repair shop. Call Phil or Tom at 517-622-0290. A great selection of accessories. Please visit the parts department located in the Service building. What are some common suspension problems? 1. Poor wheel alignment: The wheels have to be pointed in the right direction and aligned for toe-in, camber and caster. If they aren't, your steering won't be centered when you're going straight and tire wear will increase. Wheels get knocked out of alignment by potholes and curbs. 2. Shock absorbers: When they wear out, you should notice more bouncing after a bump and a whole lot of shaking driving on rough roads because they can't keep the tires planted on the pavement. 3. Springs: These are what hold the weight of the car, and as they wear they can sag or break. If your car is on level ground but one corner is lower than the others, that's a sign of a damaged spring. The parts department would like to highlight the career of Parts employee Tim Van Oort. Tim has been with Crippen for 5 years, with 40 years of experience in the parts business. Tim lives in Holt with his wife of 35 years and has 3 grown children and 5 grandchildren. Tim enjoys gardening and watching baseball (Tigers fan) in his spare time. Become a fan of Crippen on facebook, either through your own facebook page or on the facebook link on //crippen.createsend1.com/t/y-l-hhwkjy-jddktdtylt-u/. See pictures of the staff. We appreciate any positive reviews as well. 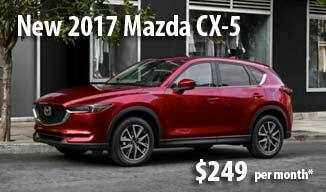 Lease the all new, redesigned Mazda CX-5 for as low as $249 a month for 36 months with $1999due at signing. OR take advantage of huge savings on all remaining 2016 Mazda?s with offerings of $2000 in incentives or 0% financing for 5 years. Click www.crippenmazda.com to view Inventory and offers. We are pleased to announce that "your piece of mind" just got better. When you purchase a vehicle with less than 120,000 miles and is outside of the factory warranty, it will be backed by 6 month or 6,000 mile limited warranty on internally lubricated parts of the engine, fuel system, transmission cooling system and power steering. Look for the BG Pre-Owned Vehicle Protection logo on the windshield. Remember to ask your Business Manager how you can improve this coverage. Have you ever wondered how you could pay your loan faster and save on interest on the loan at the same time? Be sure to ask our Finance Department how to set up your vehicle payments Bi-weekly. Payments can be set up as an automatic debit every 2 weeks which could save you up to an additional 7 months on your auto loan. Not only will it save you time but also interest as well. With summer travel coming you need to make sure your tires can withstand the heat. Come see our service and tire center now through June 30th 2017, buy three tires and get the fourth one for only $1 plus taxes and mounting fees. You will also receive a full factory Multi Point Inspection complementary of our Mazda factory trained staff. Be sure to look at the monthly Parts Department Specials for great savings. Click Here to view special offers. Summer is here and now is the time to get your vehicle looking sharp for the driving season. Stop in anytime Monday through Friday from 7am to 6pm for a free estimate. Call Phil or Tom @ 517-622-0290 to reserve an appointment today. Remember you have the right to choose who will repair your vehicle. Your insurance company may suggest a shop, but the decision is yours! The body shop would like to highlight the career of George Carter. 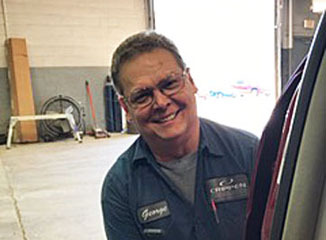 George has been a collision technician at Crippen for 35 years. He has been married for 34 years and has two grown children. His son is a biologist with the National Forest Service and his daughter is a Doctor of Physical Therapy. Thanks for the many great years of service George! Become a fan of Crippen on facebook, either through your own facebook page or on the facebook link on www.crippencars.com. See pictures of the staff. We appreciate any positive reviews as well.